I love Hawaii for the same reasons everyone else loves Hawaii. But most of all, I love the food. Fresh poke from the fish counter at KTA on the Big Island. Guri guri from Tasaka on Maui. Saimin from Hamura on Kauai. And of course, the plate lunch, which should be anointed as the State's official dish, if it hasn't already. When Hawaii's native son, Barack Obama, went to vacation there this summer, guess what was first on his mind. That's right: the plate lunch. This is a meal specifically formulated to satisfy, consisting of two scoops of sticky rice, a scoop of macaroni salad and a massive mound of meat. Gut filling, unflinchingly fattening, the plate lunch represents what modern Hawaii is: a singular culture born from a whole bunch of others. But above all, it's uniquely American. And although I still can't get a decent poke anywhere in O.C., the plate lunch has successfully crossed the Pacific to the mainland, where it has been embraced. Tustin, for instance, has at least two Hawaiian joints specializing in it. One is Waikiki Hawaiian Grill, a tiny cubbyhole of a take-out place in the shadow of an Office Depot, which performs feats of wonder with its chicken katsu. The latest is Ono Hawaiian BBQ at The District, which is arguably the most successful eatery at the center. Finding a free table there at lunchtime is just as tricky as snagging a parking spot near the place. Though Ono is part of a larger chain that spans two states, it's still relatively small compared to the L&L empire. If L&L is KFC, Ono is Popeyes. And like I prefer Popeyes over KFC, I prefer Ono over L&L. Their plate lunches are formidable. The one that would've sated even Iz Kamakawiwo'ole is the Hawaiian BBQ Mix ($7.69). It should speak volumes when I say that the picture the restaurant uses on its menu marquee doesn't do the actual dish justice. What you get is significantly more insane, like the cooks intended to feed zoo lions. But if quantity was the only thing going for it, I wouldn't have bothered writing this post. The kalbi is tender and luscious, the deeply-flavored chicken comes in two thick slabs (dark meat, of course); but the coup de grâce is their BBQ beef, which seems like its chipped off from the best parts of the cow -- a sweetly carnivorous meat treat. They do their surf as well as their turf. Mahi Mahi ($7.19) is served up in more manageable, easy to eat portions, but done perfectly. Though the pieces are most likely from frozen, they're still great. The Panko-breaded fish are fried to a greaseless crisp on the outside and moist flakiness inside. They go remarkably well with rice and mac salad, especially doused in their pineapple-y katsu sauce and squirted with liberal amounts of Sriracha. However, there are two items at Ono that I found lacking, but only because Waikiki Hawaiian does it better. While Waikiki's chicken katsu exists on its own ethereal plane, Ono's katsu ($6.59) is just fried chicken. To put it another way, Waikiki's dances the hula; Ono's just sits there. And while Ono's loco moco ($7.19) dutifully fills up my stomach, Waikiki's loco moco actually does the impossible: I actually crave more than what's served. That's something when you realize that loco moco is a hamburger patty topped with a fried egg, doused in gloppy gravy and served over rice -- a dish that is ten times as heavy and fattening as it sounds. John McCain would be well advised by his doctors to stay away from it. *Update 9/23/08: I confirmed today that this week, Ono Hawaiian BBQ at The District changed its name to Aloha Hawaiian BBQ. Thanks to Johnny Automatic for the breaking news! **Special Thanks to Monster Munching location scout Cecile for the tip on Hungry Bear. I ate here a while back. I thought the portions were massive and the food was really good! But what I wanted to write about today was the fact that I tried Blake's Place based on your recommendation. You are well aware of my shooting down every BBQ place you write about because I eat BBQ in Texas and Oklahoma City and just feel no one can come close. Blake's was awesome!!! I was so happy. FINALLY a decent bbq place in OC!!!!!!!!!!!!!!!!!! Ribs were tender, bit not too tender. I don't like them when they are overly tender. Cole slaw was great with just the right amount of "tang". BBQ beans awesome. Its not "quite" Texas BBQ, but pretty damn close. The only thing I could criticize is the sauce is a tad bit too sweet and I felt it could use more "flavor"
At least they don't pre cut their sushi fish. Ono Ono baby! I love it too, although Waikiki still reigns supreme in me heart. That little Korean lady at Waikiki is the cutest. She always gives me extra kimchi 'cause I'm a "growing boy". Thanks elmo I didn't know that the District had this hawaiian place i enjoy the District but it is just remarkably awful in design being impossible to drive around and find a parking but I do love that gigantic Whole Foods. And while the thought of politics mixed with foods often makes me retch you did a wonderful job of being non-partisan, which is what keeps me reading your blog but a bit touchy on reading your OC weekly articles. Ohhh! Just found your blog! I added you to my oc blogroll. I'm always looking for Orange County Blogs and I'm trying to get a list of them all in one place. On this post, my husband has been wanting to go here. Thanks for the info. Elmo, as a local boy from Hawaii I am really attracted to plate lunches like moths to a porch light. I tried the Ono Hawaiian BBQ near the Puente Hills Mall and it was like having a moth sprayed with Raid. I tried their chicken curry and it was bad. They used the BBQ chicken in the curry and the sauce was just this goopy cornstarchy curry colored stuff. All of this was on top of shredded cabbage. I never had chicken curry like this...ever until I ate at Ono Hawaiian BBQ. I've had curry from a can taste better than this stuff I ate. I also tried their loco moco. Swanson's salisbury steak dinner tastes much better than the stuff at Ono's. This place should not be called Ono Hawaiian BBQ. Instead it should be called Palu Hawaiian BBQ. Now for L&L, not all are the same. I think the one in Cerritos is the best one on the mainland. Oh, I wish I could eat a plate lunch at Rainbow's in Kapahulu. That place rocks! 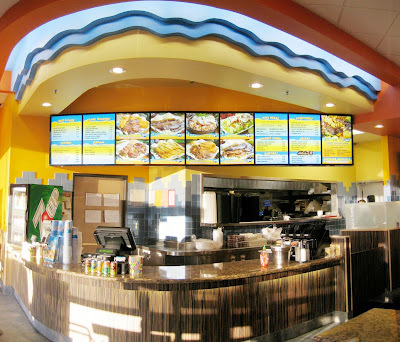 Tried Ono Hawaiian a few times in Tustin District (Near Target and Daphne's - NOT near the main movie theater area). We find the food good, but the service is terrible. Seems they have people working there who have no concept how to run a restaurant at peak times. I've seen people wait 15 minutes for simple order, where only 3 people ordered in front of them. Not acceptable for the lunch crowd. The owner has a nice location and good food (MUCH better than other Ono locations), but they really need to fix the service. kirkk points out what doesn't look right with the loco moco, which is indeed the lack of necessary gravy that completes the meal. I wonder if this was an oversight, or if this is how they serve their loco moco. Two other Hawaiian chains in OC are Maui Hawaiian BBQ (in the shopping center where Costco is in Fountain Valley) and Aloha Hawaiian BBQ (one on Brookhurst in Fountain Valley, the other on Bristol in Costa Mesa). Maui Hawaiian is my favorite of the bunch, and the one I seem to go back to regularly. Haven't been to an L&L in awhile since the one in the Murakai marketplace in Costa Mesa closed up. Is the L&L on Culver in Irvine still there? 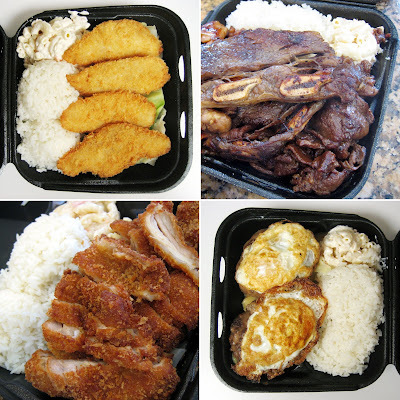 Haven't tried Ono Hawaiian yet, but have tried Ono Ono Hawaiian BBQ (a different chain located on 17th St in Tustin). I'll have to look for Ono Hawaiian next time I visit the District. I didn't see it the last time I was there. I was just in front of Ono yesterday. I parked there so I could pop in to Target. I'm there most weekends though, shopping at Whole Foods, so I should really give it a try. I know what you mean about the katsu at Waikiki though. That place is like walking distance for me and my husband really digs their chicken. Speaking of which though - you ever try Barolo Italian Cafe next to Waikiki? That place is awesome. It was my birthday dinner for me and hubby this year (the sushi I mentioned in the comment on Wasabi was my dinner with my best friend). If you get a chance, and a yen for some authentic Italian, I suggest you give it a shot. My friend Cecile knew you would love Blake's Place. It was with her suggestion that I went and reviewed it. And of course, I love it too. That Korean lady is sweet. And so super nice. Plus her husband (I'm assuming) is so focused when he cooks in the back. It's no wonder the katsu is so damned good. Attention to detail: it makes a difference! Yes, like ice cream and chili sauce, food and politics don't mix. But I couldn't resist putting in the bit about Obama and then the thing with McCain on this one. And I think I only mentioned something slightly political once before in an OC Weekly review. I'm inherently apolitical. Thanks! I'll blogroll you too shortly. This Hawaiian place is worth trying, if only because it'll also make your hubby happy and well-fed! In terms of this particular Ono and the local L&L (the one on Culver and Walnut), this one's better -- though I've never tried the curry at either place. It's all about the BBQ'd meats for me! I think the gravy thing was partly my doing. I was just reminded that we got the gravy on the side (to-go order) so as not to make the whole thing soggy before we got home. But still, it just goes to prove that this loco moco wasn't as memorable as the one I had at Waikiki. Well, that's what chains are all about. You get employees who are paid hourly with no stake in the business. As Chubbypanda pointed out, at Waikiki, the owner is also the one manning the counter, so the service is always warm and personal. Though it does take more time for the food to be prepared there -- they're a smaller operation. order it the way they make it. And yep, if I'm not mistaken L&L on Culver is still there. At least it was the last time I checked. I've always wondered about Barolo. It looks like the type of place I would love, but then I wasn't sure because I hadn't heard anything about it. That is, until now. So thanks! By the way, I recently tried Roma d'Italia and was pleasantly surprised! I was just over at Whole Foods and drove by the Target. The Hawaiian BBQ place near Daphne's is an Aloha. Either they just changed or there are two at the District. I like Aloha, especially since there is one right across the street from me on Chapman in Orange. I like their chicken katsu a lot and they have a good $5.99 lunch special where you only get too much food instead of 3 days worth. Wowzas! I called and checked and you are absolutely right. Ono just changed its name to Aloha this week. Strange! This visit I made last week was probably by sixth or seventh this year, yet when I finally decided to write this post, they decide to change the name. Are they trying to avoid me? HA! I have been to this Ono in Tustin twice and each time I went there I found multiple stands of hair in my food. The few bites of food I did have before I go to the long hairs was average at best. Hair in food once shame on you .. hair in food twice Call the Health board. I've had the Saimin from Hamura on Kauai a few years ago on my honeymoon. It was hot steamy and humid in that little restaurant, but one of the best meals I had in kauai. We also had a plate lunch at some hole in the wall that had great beef stew as a side dish, and I've found that no Hawaiian places here have beef stew. I really like this place and find that their portions are large. I think i like it better than L&L(and L&L's mac salad is way too mayonaisse-y imo)! I'll chime in with some feedback on Aloha Hawaiian BBQ on Bristol Street in Costa Mesa. Now open a little more than 2 years, it seems to have lost a bit its original luster...the food doesn't seem as consistently fresh and lovingly prepared as in those glorious early days. On the plus side, the food is sometimes good -- especially the kalua pork, which is a real treat with droplets of Sriracha on it. To my knowledge, the prices have never changed in two years, either...the kalua pork mini-meal still clocks in at $4.59, very reasonable for what you get. The staff leaves something to be desired...most of their cashiers are usually timid and not exactly Ivy League material, and it's kind of unappetizing when you see their cooks dragging trash out of the place one minute, and then touching food the next. I've heard good things about Roma D'Italia from some others whose opinions I tend to agree with as well. Have to try it. And yes, definitely give Barolo a chance. You'll be pleasantly surprised. You can always check out their menu on the window before taking the leap. The food is 4 to 5 stars usually, but add good service and nice casual atmosphere on top of that and it's a great experience. Just wanted to throw out my formal hi to you. I don't eat down in the OC much but when I do I often use your posts for advice. Thanks! Long hair, any hair in food is definitely not ono (the Hawaiian word for "delicious"). I got mild food poisoning from another Hawaiian place in Irvine that shall remain nameless, and yep, I never go there again. Isn't Hamura one of those diamonds in the proverbial rough? Their handmade noodles are simply amazing, as are their chiffon cake and BBQ sticks. Funny enough, it's owned and operated by Filipinos! Buy one get one free coupons! Man, I need to pay more attention to the Pennysaver! Thanks for the tip! Ugh. Well, that's discouraging news. Though to be honest, since it's out of the way for me, I haven't been to that Aloha in years...luckily. I hope that sort of thing doesn't happen to this one, which as you may have read, is now an Aloha. Barolo sounds great! Mom and pops are the only way to go for Italian. Though I don't think their food is too bad, I haven't been to Macaroni Grill in ages -- simply too many independents which offer better for less. I also like Flavio's on Newport. Hey there back! And thanks for leaving this note. I just read your blog. It makes me wish we had a Little Sheep down here. Mmmm, just mentioning the word Hamura's Saimin brings back awesome memories and hunger. That is the best saimin I ever had. Palace Saimin on Oahu is a pretty good place to visit too. My understanding is the Hamura's Saimin is still owned by the family. The current owner is part Filipino and I think is the great grandson or grandson of the founder. That's good that Hamura is still with the original family, but with an added Filipino component. Just goes to show what a melting pot Hawaii is. OMG! I love poke!! I have been trying to find good poke in the OC for awhile, I've even debated trying to make my own! However I was wondering if there are any places that you would recommend getting poke at? I have heard of Marukai selling poke, however I am going to school on the east coast and can only go back home during the holidays to search for poke. I usually go to Full Moon Sushi in Fountain Vally to get their poke bowl, however it is not always consistent. When they are good, the rice is fresh and the fish is of high quality and super fresh. However I have gone there a couple times when the rice is not as fresh and the fish was not very well cut. But for (I think) $8 it is a really good deal and if u ask for their "crazy" poke bowl, they add siracha over the top to make it spicy. I, too, have heard that Marukai is the place for poke. I haven't been, but I believe it just sells the components so that you can make it yourself. I have had poke bowls around OC though. I think the worst one was at Honda Ya (a place I usually love) and the best was at Tommy's Sushi (a place I kinda like). This is no longer called Ono Hawaiian Bbq. this place is a rip off of Ono's Hawaiian BBQ. I work across the street from the district and that's what they were called before they changed there name to Aloha BBQ. Hmm I wonder what happened? Since I'm the party planner at work (which consist of 200 employees just at corp) I've used Aloha BBQ a few times spending anywhere from $50 - $1000 each time. They've been decent for what they cost even though they don't deliver and they add cabbage to ever dish to make it look fuller, but today was the worst experience I've ever had. Yesterday I ordered a "small" catering tray of teri chicken, bbq beef, and rice which the menu says serves 10 - 12. I had 20 people I had to feed for a pot luck so I choose the small trays thinking that would be enough. Long story short the poor cashier got the manager who was hesitant to give me a discount even though i had to spend an extra $20 out of my pocket cause the person who took my order couldn't mention to me that the menu was misprinted. Mean while an older lady walks in with all this bling and an expensive purse (the owner/manager's mom) and the manager goes to her to explain the situation. She doesn't even glance my way yet acknowledges my existence and walks to kitchen. How is that for costumer service. I have spent hundreds of dollars there, and has had to pick up my own catering for them to not even discount a $20 tray cause they f***ed up for something that cost them less than 5 bucks. Sorry Aloha BBQ you have lost my business forever. Whenever I get a craving for Hawaiian food, Ono Hawaiian BBQ ends up being my pick simply because it's closest to my house. I especially like the Spam Musubi here because you actually get 2 sizable portions with your order. What I've noticed about the kalbi ribs at Hawaiian restaurants is that the flavor is not as sweet as I would like it. My all-time favorite place to get kalbi ribs is Yummy's located in Hawaii only (i think). Their kalbi is DELICIOUS...HANDS DOWN!! I also think the kalbi ribs at BCD Tofu House is pretty good too - quite a different flavor when from a Korean restaurant vs. a Hawaiian one. But whenever I feel like that "local flavor", Ono Hawaiian BBQ is where I usually go!